Miriam Toews is quickly becoming one of my favourite authors. She is a reminder to me of just how good Canadian literature can be. It has inspired me to become more serious about supporting Canadian authors- so I will be reading and talking about them a lot more on this blog! 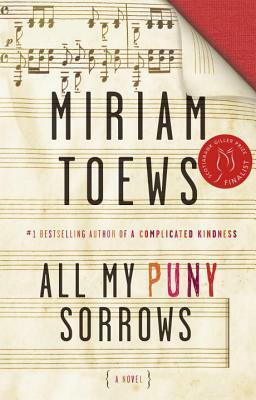 All My Puny Sorrows was a finalist for The Giller Prize in 2014, and I am personally of the opinion that it should have won. What Toews can do with her characters is nothing short of genius. This is a book with very little plot, but the characters themselves propel the story along. You feel as though these characters are your family friends or your neighbours, and I quickly became invested in them. This book has a trigger warning for suicide. The story is centered around two sisters, one who wants to die, and the other who desperately wants her to live. There are a lot of moral and ethical questions that are raised, and one of the sisters truly wrestles with these questions throughout the book. The book also explores what it is like growing up in a Mennonite community- which is something Toews has personally experienced. The book almost reads as a memoir, and Toews has admitted that the story is largely autobiographical. Knowing that makes it that much more gut-wrenching. All My Puny Sorrows is a hard book, but it is also real and it is honest. Great review! I’m yet to try Toews but I’ve heard so many good things. Thank you! She is genius! Thank you! It is definitely worth checking out! Glad to hear you enjoyed this, I haven’t read any Toews but I want to pick up Women Talking soon! I adored Women Talking! Difficult read but so well done!